All of the recent findings from Kepler and New Horizons has got me excited. Really excited. Like many people I have a childlike fascination with the stars. It’s not just that I want to know what’s out there, or hope for something bigger and more. I just have a love for the possibilities of what it could be. Over the years this has fueled my interest in movies and TV, books and comics, and video games existing within the sci-fi genre, and the cyclical relationship between sci-fi and the factual science that it is both based upon and spawned from. This adventure of exploring the stars is one of my favorite gaming experiences. It’s what brought me to Eve Online, and it’s what brings me to Elite: Dangerous, with its 400 billion star systems recreating our Milky Way waiting to be explored. 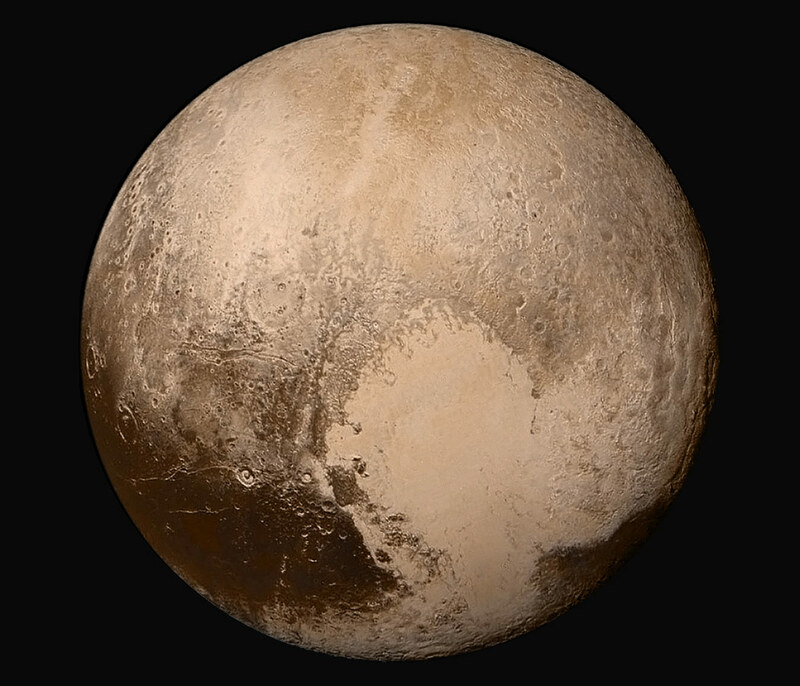 Being the busy bee that I am, I haven’t had much time to play lately, but I’ve been impressed to see how well the dev team realistically portrayed entities such as Pluto. 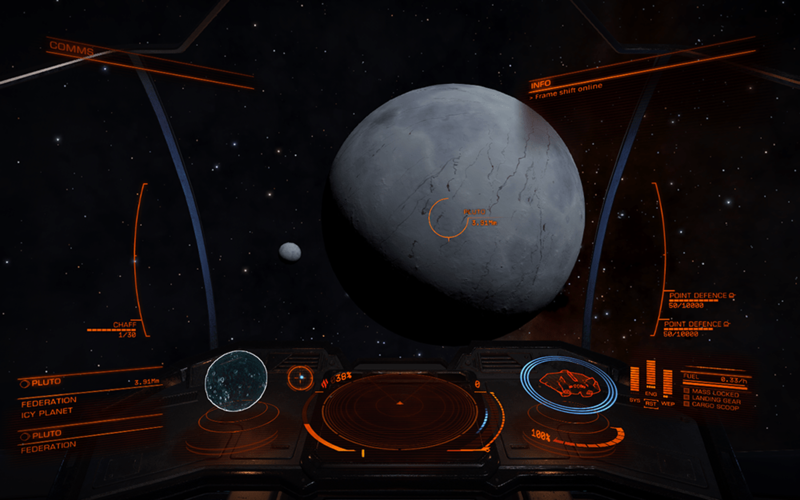 You’ll notice Pluto and Charon look a little different in Elite: Dangerous, though we’re pleased by how closely our simulation has matched the ‘smooth’ heart-shaped area on Pluto. Our simulation assumed a more dramatic effect from the mild volcanism caused by tidal heating from interaction with Charon, which would uniformly refresh the surface over time. There’s still 1,300 years between now and 3301, which means around five more orbits and five more heating/cooling cycles between today and the era of Elite: Dangerous. It’s possible the renewed surface could spread to cover the entire body by 3301! When I do play the game I switch to single player so I can just focus on exploration, and with the galaxy now so easily within reach of my X52 flight stick it gets me thinking about the rate of discovery that can be achieved. Last year Tim Urban had an excellent post on the Fermi Paradox which captured the scope of the Milky Way and the likelihood of finding Earth-like planets and the possibilities of life. It helps reinforce my feeling of wanting to toast the author each time I see an Elite: Dangerous player post describing their first Earth-like discovery. Now this was before the recent real-world discoveries, which now has NASA claiming extraterrestrial life will be found within the next 10-30 years. That’s in my lifetime. That’s crazy. Frontier Developments, makers of Elite: Dangerous, recently released some data on how players have been playing, and specifically discovering, within the game. There are approximately 1,200 players who have logged 1,000 hours or more into the game over the past eight months. That’s 1,200,000 hours of play, or around 137 years, just from the top players by time logged. In that time players (equipped with FTL capabilities) have discovered 11.3 million systems. At first look, that’s a staggeringly high number — 11.3 million — but Frontier is quick to point out that this rate of discovery will require another 23,417 years to completely map the galaxy. After all, 11.3 million is less than 0.003% of the full 400 billion star systems offered within the game. Now just think about that, and how long and haphazard our ventures (without the benefit of FTL) in search of life might be before we find success. Or, on the other hand, how minuscule the chances of finding an Earth-like at the rate of discovery we can currently manage.